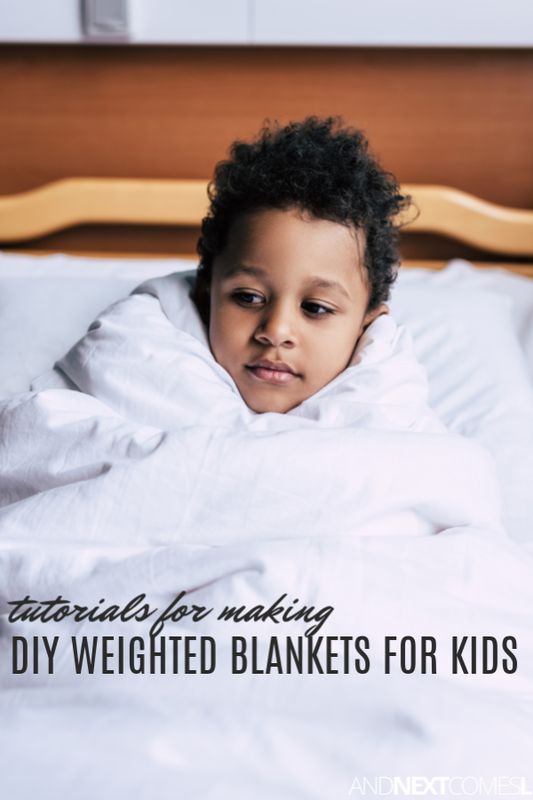 DIY weighted blanket hack and tutorials for how to make a weighted blanket for kids. The one DIY sensory hack that I have wanted to do for a long time is to sew a weighted blanket for my son with autism. However, I get freaked out just looking at the amount of work involved in making one. They seem like so much work to make, so I must admit, I have been brainstorming an easier way to make one. Yet, I cannot seem to come up with a good solution. At least, not yet. 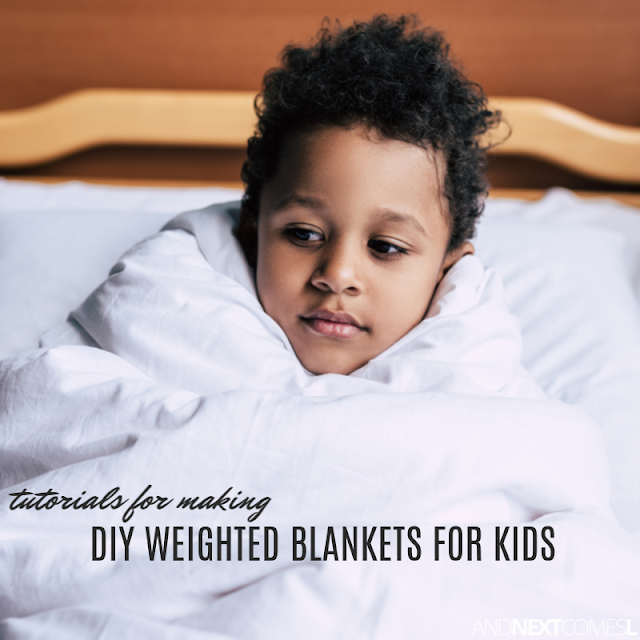 In the meantime, I thought I'd share some amazing tutorials for making a DIY weighted sensory blanket for kids with autism and/or sensory processing disorder. Weighted blankets are a great way to provide proprioceptive sensory input to your child. They can help calm your child and even, gasp, help them sleep better! Buying a weighted blanket is expensive! Thankfully, there's these wonderful tutorials for how to make a weighted blanket for kids with autism and/or sensory processing disorder to help you save you some money! 1. Homemade Weighted Blanket (pictured) from Mama Smiles - This step-by-step tutorial is very detailed! 2. How to Make a Weighted Tie Blanket (pictured) from Parenting Chaos - A nice alternative to sewing an entire weighted blanket from scratch. The kids could even help with the tying. 3. Weighted Blanket with Printable Pattern from Craft Nectar - This tutorial includes a free printable pattern, so you don't have to hover over you computer while you sew. Nice, right? 4. Adjustable Weighted Blanket Tutorial (pictured) from Confessions of a Fabric Addict - Love the idea of an adjustable weighted blanket so that it can grow with your child. 5. Weighted Blanket Tutorial (pictured) from The Squishy Pickles - I love the fabric on this one. Such a bright and colorful weighted blanket for kids! 6. How to Make a DIY Weighted Blanket from I Love My Kids - Another very detailed step-by-step tutorial! 7. How to Make a No Sew Weighted Blanket from Junior *gluten-free* Chefs - Yes, no sewing is required for this weighted blanket! 8. DIY Duct Tape Weighted Blanket with Printable Instructions from Jest Tu Positive - No fabric is involved in this DIY weighted blanket. So grab some rolls of colorful and/or printed duct tape to give this one a try! 9. How to Make a Weighted Blanket (pictured) from Sharing the Weight - I love that this tutorial has a chart of the finished dimensions for different target weights of the blankets. 10. Weighted Blanket Tutorial (pictured) from Dandelion Mama - I love the fabric that was used for this weighted blanket. 11. How to Make a Weighted Blanket Tutorial from East Coast Mama - This one is a really cute dinosaur print! 12. Weighted Blanket Tutorial from Feeding Raya - Another beautiful blanket with a detailed tutorial! 13. DIY Adjustable Weighted Blanket Tutorial from Needles & Bows - Another awesome weighted blanket that's adjustable! A weighted blanket is great for kids with autism! Sometimes they just need that pressure and feeling to help them. Thanks for sharing this! Yep! These kids tend to enjoy deep pressure like they can get from weighted blankets. Can someone advise for the weight recommended for a five year old? We have an online sale here in New Zealand at the moment and they range between 2.3 and 9 kg... and I have no clue!